Where has THIS guy been all campaign? "A Plumber Is The Guy He's Fighting For." Seen today in Dawsonville, Georgia: a truck with a big sign on the back that read, "I love Joe the Plumber." The media are trying to claim he's unlicensed, although his company is, and he is enrolled in the apprentice program -- and not eligible to complete the apprenticeship until next month. The union -- Local 50 of the Plumbers, Steamfitters and Service Mechanics, which has endorsed Obama -- is making noises unsupported by the law (see the comments), in order to convince the media that he's not one of their plumbers and shouldn't be allowed to work. Union leadership has never been known to make dubious, politically-motivated claims before (or self-interested ones -- for example, putting out the notion that no plumber unaffiliated with them was legitimate) so I am sure we can trust them. Obama stopped by this guy's house while Joe was playing football with his kids. Obama picked this guy to ask a question. And then the Senator broke a key rule: he gave an honest answer. So now the Alinsky playbook kicks in: Joe must be destroyed. He must be shown to be a liar ("He's not a plumber. He works for a plumber. "), a criminal (He's not licensed! Whether or not he could be yet! ), a thug (Sammy Davis Junior! ), and possibly a Republican plant (indeed, planted years in advance in a neighborhood Obama would pick at random in which to campaign, presumably under the influence of some sort of mind control ray! That was probably how they got him to answer the question honestly, too). Union muscle is brought in, democratic officials in the government, the media, the liberal bloggers, everyone focuses on wrecking this guy's life. Not figuratively speaking, either. That American Dream of his, to buy the company and build it? He needs to be out of a job instead. Joe's us, folks. Look hard. There's some rule you haven't followed, or that someone can plausibly claim to the ignorant that you might not have followed. You're a hypocrite. A criminal. You'd better watch your step. You'd better keep your head down, eyes on your work. If you want to continue to have work, you know what I'm saying? "This Really Is The Apocalypse"
Ben Smith notes an email from a Republican focus group. There is a remarkable amount of 'end times' language surrounding the Obama candidacy, and as we've discussed, some of it is really his own fault. Obama is a scion of the Alinsky movement, and Saul Alinsky did dedicate his book on "community organizing" to Lucifer. All those emails I've been getting warning that Obama is the Antichrist? I've spent my whole life thinking the Book of Revelation was impossibly vague to be considered a useful prophecy, and that it was always foolish to trot it out to try and interpret contemporary events. As Dad29 says, though, you don't have to think "Antichrist" -- it's enough to think "Lucifer," because Alinsky did. The Alinsky method is deeply inhumane: the declaration that you should 'hold opponents to every part of their rule book' is intended to rule out compromise and discourse. Every opponent is a hypocrite, because every opponent is human and people can't live up to their every principle all the time. The system intentionally makes the perfect the enemy of the good, in every case, all the time. I hope Jim Webb is right, and I'm wrong: and it is comforting to find that there are people I respect who are Obama supporters. I know I can put some faith in them, even if I have none in the man himself. Jim Webb is out there, Phil Carter of Intel Dump, retired General Zinni -- these are people I respect, whether or not we always agree and even when we rarely do. That's comforting. It's important to have trust in such good and worthy men as there are on the other side, in the event of an Obama victory. We shouldn't follow Alinsky's road -- of making the perfect the enemy of the good, and all our opponents enemies. Sen. Obama himself is an unworthy man and the follower of a vicious creed, but with him come also good men of accomplishments with whom we have only some disagreements. In the event that we are forced to endure an Obama presidency, I am glad to know there are good people on his team. This guy is the kind we need more of in our country. PM: To you, what exactly is the American Dream? Can you explain that? JW: Me personally, my American Dream was to have a house, a dog, a couple rifles, a bass boat. I believe in living life easy and simple. I don’t have grand designs. I don’t want much. I just wanna be able to take care of my family and do things with them outdoors and that’s about it, really. I don’t have a “grand scheme” thing. My American Dream is just more personal to me as far as working, making a good living and being able to provide for my family, college for my son. Things like that – simple things in life, that’s really what it comes down to for me. That’s my dream. PM: Do you think your question surprised Obama, caught him off guard at all? JW: Well that was actually my intent. Most people, you ask them “do you believe in the American Dream?” Nine times out of ten they’ll sit there and go, “Yeah, of course!” That’s where he messed up, because as soon as I asked him that, his answer shows that he doesn’t believe in the American Dream. You know, like the question you asked before – he pretty much contradicted himself. “I don’t want to punish you but – “ Well, you’re going to anyways. The whole interview is great. This guy is just what America is all about. You folks liked the last picture from the firepit, so here's another from earlier in the week. This photo shows me teaching a boy how to clean a lever-action rifle. Mine, in this case, is a Cimarron Firearms Winchester '73. He is cleaning a Henry "Golden Boy" .22 rifle. If you're moved to music by the photo -- while I didn't find a copy of "Back in the Saddle" by Cowboy Nation, I did find their MySpace page. If you skip to track 6 on their autoplayer, you can hear their version of My Rifle, My Pony and Me. So, via FARK, a story about a couple who decided to declare themselves sovereign nations. [I]n the 1990s, they stopped paying taxes and declared themselves independent of all government authority. They have been battling government ever since. Joel, 76, went to jail. The IRS went after their money, and Seminole County sold their home because of unpaid taxes. Now, they face a new battle: Florida's attorney general is suing them, accusing them of fraud and harassment for filing a lien naming four Seminole County officials: Sheriff Don Eslinger; State Attorney Norm Wolfinger; Clerk of Courts Maryanne Morse; and Clayton Simmons, chief judge of the 18th judicial circuit. The couple recorded the lien in April, claiming ownership of every piece of property held by those officials. The lady is in trouble for paying for things with a "money order" she wrote herself, claiming that as a sovereign nation she has the right to create her own financial system. The husband has been arrested multiple times for driving without a license -- as a sovereign nation, he need not bother with the laws that touch mere citizens who want to drive on the road. ...and then I got to this part. When the Brinkles declared their tax independence, they owned those 5 acres in Geneva. Now they rent an apartment in a low-income section of Sanford. They have central air conditioning and heat but can't afford to run it. When Donna needed dental work, the couple's church and one of their adult sons paid for it, Donna Brinkle said. They scrape by on $1,300 in monthly Social Security benefits, she said. I would be willing -- eager! -- to sign away all future Social Security benefits in return for the right not to pay any more into the system. But to claim you are totally immune to any law or duty to the United States, and live off the public treasury? That's their conception of a sovereign nation?? The mind attempting to grasp this line of reasoning loses its focus, like an eye staring into a vertigous canyon. Just how far down does this thing go? This is the #1 domestic policy issue for millions of voters on each side. Normally it's a huge issue. Maybe the differences are so stark, this year nobody feels we need to debate it. Normally a minor issue, but one we do usually hear about. It is surprising that Gov. Palin was not asked about these issues given her decisions about child rearing. It is odd, given the heat Gov. Palin has taken in the media on the subject, that no one asked about this. Maybe the media prefers their straw man version of Gov. Palin's position to her actual position, which is rather moderate. This is another issue to be the #1 domestic policy issue for millions of American voters. Unlike with abortion, where the difference between the tickets is stark and obvious, on the matter of gun control there is significant obfuscation. Sen. Obama served in the Joyce Foundation, which under his hand spent millions trying to produce anti-gun-rights organizations, and as a Chicago politician took a position on gun rights that was far less friendly than the laws on the books in the majority of states. On the other hand, he says he supported the Heller decision (an apparent reversal from an earlier position). Sen. McCain, meanwhile, has not been a consistent friend to gun rights. Libertarian presidential candidate Bob Barr said he expected to get the NRA's endorsement (due to his A+ rating from the NRA and membership on its board), but did not. Gov. Palin is the only person in the race with a clear, uncontradicted record she will stand by. Probably this is an issue like abortion, where people feel there is little need to discuss it. Sen. Obama voted against both Roberts and Alito, and said that he felt Justice Thomas was unqualified. I think we're pretty clear on what kind of justice he feels is qualified. Sen. McCain is the most immigrant-friendly candidate in recent memory, but his base is opposed to heavy immigration. Sen. Obama is probably also friendly to pro-immmigration policies. This may be the opposite of the abortion issue -- there's not enough difference between the candidates to bother with a debate. 7) Race, racism, affirmative action. Now that's an interesting set to be absent. My guess is the media doesn't feel we should be talking about those things at this time. It's an interesting list. I think most Americans, asked for their top three priorities, would find at least one of these issues on the list; and if you ask people for their top three issues other than "the economy" and "the war," you'd probably see two or three of these items on the list. None of them have been mentioned in the debates. There's a lot to do to prepare for a long deployment. Some of it is making sure to spend time with family and friends. Tonight we had Grim's Buffalo Chili, cooked on a fire over my own firepit. The hard part will come soon enough. There's still a little time for the bittersweet part. 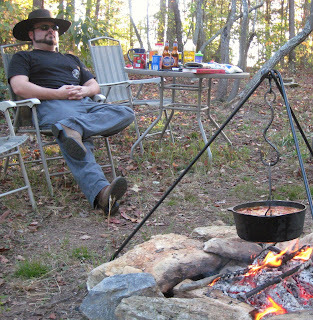 Notice the hook holding the Dutch oven over the firepit. That was forged from a piece of scavenged rebar by a former Navy SEAL turned blacksmith, "Tiny" Robinson of Moose Creek Forge. The last time I talked to "Tiny" (the nickname is precisely like "Little John" in its form and function) he told me he'd had to give up the hammer due to arthritis. That's a pity, because he was a real artist: one of the very best. "Only a Woman Could Make A Man So Foolish." In honor of this story. My favorite version of this Gene Autry song was by the band "Cowboy Nation," but I don't see a verison of that one available online. These guys are good too. Horses like it if you sing this to them. It calms their nerves. If you know of a Jerry Reed version, send it. UPDATE: I give up. Here's Chet Aktins and Marty Robbins, the later-great Cowboy singer. And here is Marty Robbins alone, rounding it out. That last one I first learned from Atlanta's "Banks and Shane" group, who recorded a cover version on an album my father owned. "The Western Financial World is Over." "But, some of us have some money in the Western financial world!"